Even as a little girl, Selene had always been adventurous, climbing trees and finding new adventures in every nook and cranny. She was never accepted by either gender—all children thought she was too outspoken and strange. Little did she know how different she truly was until an encounter with a mysterious stranger changes her life forever. 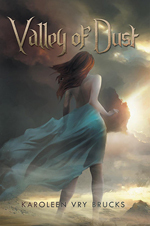 Readers can witness the intriguing events unfold in Valley of Dust, a novel by Karoleen Vry Brucks. From the moment that Lucian saw Selene, he knew she was special and that she was his destiny. He sent his brother, Anton, out to watch over her and protect her while she was still unaware of her true nature. Lucian, however, didn’t foresee that Anton and Selene would be mutually attracted to each other. Will Selene come between the two brothers? How will she handle the truth about what she is and the power that courses through her veins? Readers can unravel the exciting answers as they explore the Valley of Dust.